February | 2016 | Why Is The Internet Broken? 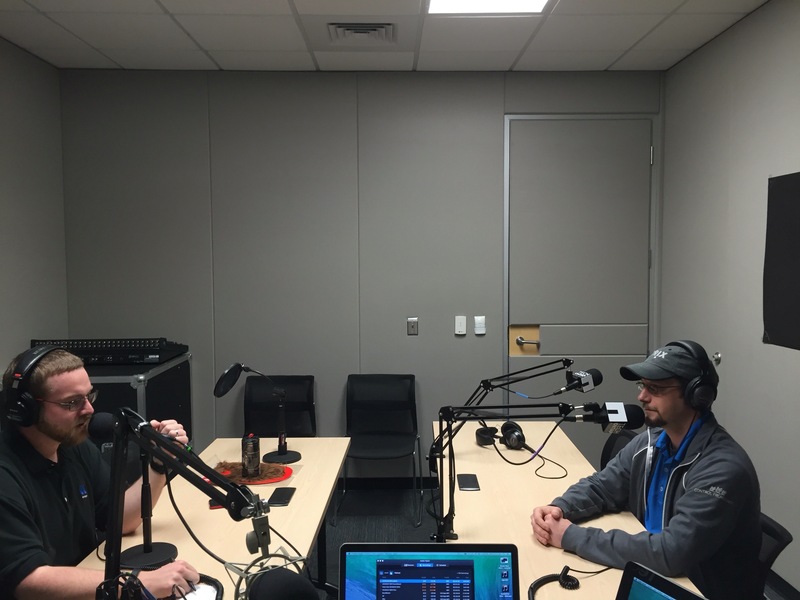 Behind the Scenes: Episode 28 – SolidFire: I have one. Now what do I do with it? This episode wraps up “SolidFire Month” with Aaron Patten (@jedimt), a virtulization architect at Solidfire, who is currently working on their VVol implementation. So we scheduled something with Aaron for the next morning at 9:30AM, right before the SolidFire deep dive white boarding session where Aaron was acting as the technical lifeguard. Andrew Sullivan was out this week, being an honorary Canadian while talking about containers across the Great White North. When we got Aaron into the studio, we learned he was a former sound man. Of course, we put him to work. He helped us troubleshoot and fix a mic issue that was causing an irritating hum. Aaron also mentioned some of his white papers and his blog! Oracle Protocol Performance Comparison: What’s better? FCP or NFS? NetApp’s very own Rodrigo Nascimento (@logwriter) has written up a fantastic technical report comparing protocol performance for Oracle workloads on NetApp’s All-Flash FAS. In this TR, Oracle workloads are compared on FCP, iSCSI and NFS. In Figure 1, the difference between FC and DNFS is about 10%. However, this number should not be interpreted to mean that placing a given workload on DNFS generally results in a 10% decrease in performance. Not all database performance problems result from storage I/O latency. Furthermore, the difference in performance shown in Figure 1 is at a very high I/O level. Lower IOPS levels show a smaller difference between protocols. Because of the inherent latencies associated with spinning media, SAS-based HDD storage systems cannot achieve latencies better than approximately 8ms. Although differences exist between the protocols, any protocol with AFF offers an approximately tenfold improvement in performance. What does this mean for NFS? Absolutely nothing. Sure, FCP was faster in these tests. But it’s not a block vs. file thing. It’s a “you get what you pay for” thing. FCP comes at a cost – you pay for HBAs, switches, licenses, etc. With NFS, you pay for a license and leverage your existing network. Is that added cost really worth a potential 10% boost in IOPS? Maybe. But it’s definitely worth thinking long and hard about it. Be sure to take a long look at this TR and make your own judgment, but one thing is clear – if you’re running Oracle, you want an all-flash solution. All protocols win on flash. Updated NetApp NFS Technical Reports Available for Clustered Data ONTAP 8.3.2! Clustered Data ONTAP 8.3.2 GA is here! Because of that, the latest updates to the following TRs are now publicly available! This is essentially the NFS Bible for clustered Data ONTAP. Read it if you ever plan on using NFS with clustered Data ONTAP. This TR covers NFSv4 in both 7-Mode and cDOT. Think of it as a companion piece to TR-4067. This TR covers best practices for DNS, netgroups, LDAP, NIS and other related items to name services in clustered Data ONTAP. This one is currently being updated and does not have a timetable for release currently. Keep checking back here for more information. This includes a new section on Copy-Free Transition. Behind the Scenes: Episode 27 – SolidFire: Automation for the People! After last week’s successful episode (SolidFire Deep Dive – 900 listens in just 1 week! ), not to mention a long weekend (we had President’s Day off), I was finding that we hadn’t scheduled our next guest yet. Wait. Josh Atwell (@josh_atwell)? King of the gingers? I wanted to call it “Automation for the People” in honor of R.E.M., but SEO rules. Now check out the episode! Earlier this week, I mentioned how I was going to start a new series of “behind the scenes” blogs on the NetApp Tech ONTAP Podcast. The impetus behind this was to promote the podcasts a little more and get some more active involvement from the community as a whole. This week, we had our new friends from SolidFire in the studio to do a deep dive on the technology. We started out with Amy Lewis (@commsninja) and Aaron Delp (@aarondelp) to do a high level overview. They were on site at RTP to get badges, meet people and be introduced at the Friday tradition of Beer Bash. I had met Amy briefly before, but I don’t think she remembered me. In fact, we had been communicating over Twitter DM and she messaged “Marco!” to find me. What made it funny was that she probably sent that as she was standing 3 feet from me, talking with other people at my table. I had scheduled Jeramiah Dooley (@jdooley_clt) weeks ago, when the deal was first announced. I reached out to him and Amy to ensure I got them on as soon as legally possible. I was also asking Amy to land me Dave Wright, the CEO. But that proved hard to do, given how busy Dave likely was those coming weeks. Hopefully we’ll get him on soon, but Amy did make up for it by landing a great special guest in Andy Banta (@andybanta), who I had heard of but never realized just what a superstar he was in the overall virtualization community. Andy was going to join via Skype and Jeramiah was going to be on-site on Monday after traveling to do the Tech Unplugged session with Andy Grimes (@Andy_NTAP_Flash)from NetApp. One problem – Jeramiah didn’t have a badge yet. So coordinating that was a little challenging, but not too bad. We did the show and later I found out that Andy Banta snuck some secret code words into the episode. See if you can find them and shoot an answer in the comments and I’ll send you a podcast sticker! I know this blog post seems like a love fest for SolidFire, almost completely motivated by the acquisition. But it’s really about 2 things. SolidFire have been competitors before this, so we couldn’t really be too gushy about them. However, I’ve always admired them from afar for their marketing savvy and overall tech story. It’s also about making them feel welcome from the start. It’s hard to be a company that’s acquired by another company and I wanted to make sure I did my part in being as accommodating as possible to help ease the transition. I’m sure there are a lot of good things in store for NetApp and SolidFire, and you can be sure that the Tech ONTAP podcast will be inviting them back to help tell their story. 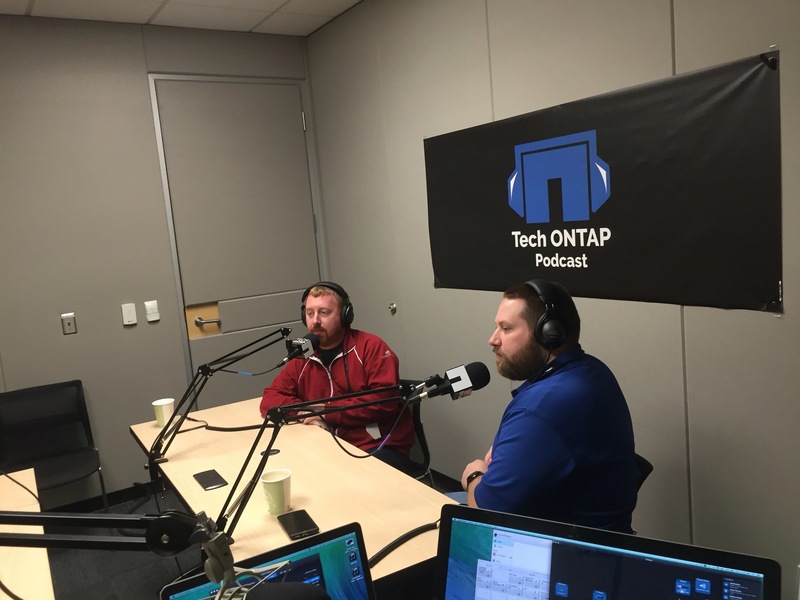 A few months ago, I was fortunate to be asked to join the NetApp Tech ONTAP podcast as a co-host. The podcast actually went on hiatus back in spring of 2015 before it was resurrected by popular demand. If you’re not familiar with the NetApp Tech ONTAP podcast (http://techontappodcast.com/), we discuss a variety of current technology trends in storage with a NetApp spin on it. 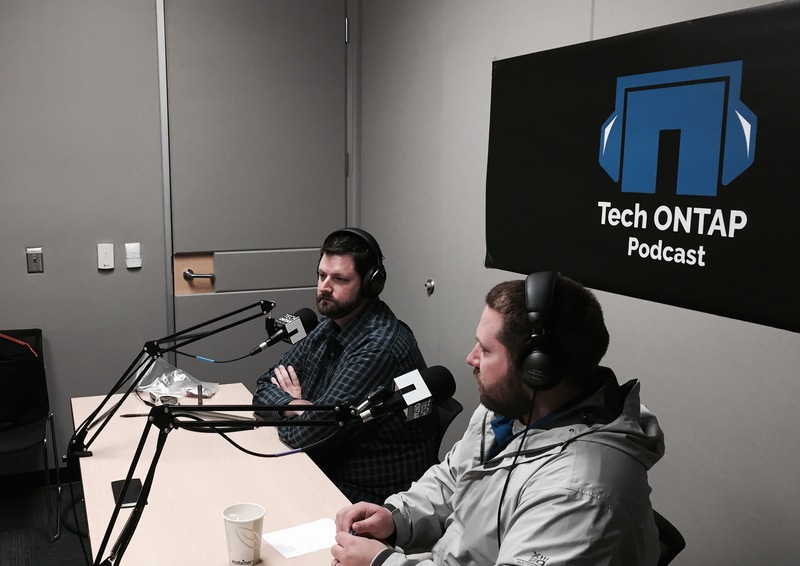 We also recently started a new promotion of “Ask the NetApp Tech ONTAP podcast” for ideas on shows, as well as questions about NetApp technology. Now, my latest idea – A “Behind the Scenes” of the podcast. Essentially, each week, in addition to the regular NetApp Tech ONTAP podcast blog that goes up on the NetApp Communities, I’ll post a look at what we’re doing inside the studio, stories that didn’t make it into the blog or other various interesting (or non-interesting) tidbits. Stuff like Amy Lewis (aka @CommsNinja) wearing the famous Guest Beard™. I’ll also be adding that week’s “Ask the NetApp Tech ONTAP podcast” question, if there is one. 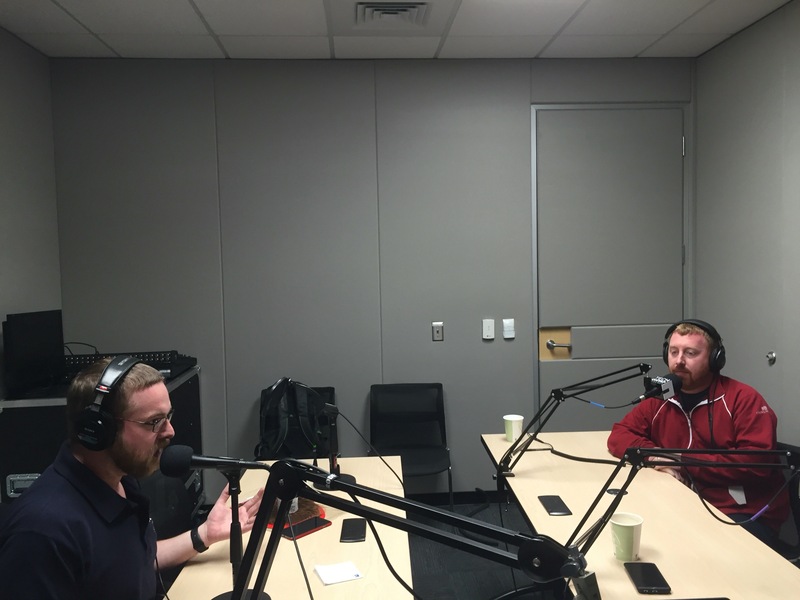 Stay tuned for updates on this, starting this week with the upcoming “SolidFire Deep Dive” podcast! If you have any questions or recommendations, feel free to email us at podcast@netapp.com. Also, if you have Facebook, be sure to “like” the Tech ONTAP Podcast for updates as well! I am an Amazon Prime member. I love the service – I get free 2-day shipping, movies I can download for free and take with me on trips and music I would never buy outright to stream for my toddler, plus a variety of other perks. Of course, this is the natural progression of things. In the race to the bottom, whether it’s all-flash storage systems, televisions or electric cars, as commodities (such as SSDs, electrical components, etc) get cheaper and companies jockey for market share, products for consumers get cheaper. In this case, FREE. Amazon offering free storage for photos is simply the next shot in the war between cloud providers and a way to further take market share from Microsoft, Google, Apple, etc in the race to the bottom of cloud storage. Which I am TOTALLY fine with, as a consumer. I like free. But what this deal underscored for me was… how on earth do I move all those thousands of photos of me, my toddler and various other things from my Apple photos to Amazon? Like any good techie, I Googled it. And I saw how much of a bear it was going to be. So much so, that even the draw of “free” can’t overcome my reaction of “I have to do what? ?” Apple photo storage is already cheap enough (and free up to a certain storage capacity). So, as a consumer, I have little motivation to move. This is a good example of “cloud lock in,” in my opinion. This is a job for… the Data Fabric! If you’re not a storage person, you likely have no idea what a NetApp is. And if that’s the case, you have less of a notion of what a Data Fabric is. Even if you are a storage person, you might not know much about the NetApp Data Fabric. Essentially, it’s this: Avoiding vendor lock-in by giving the owners of data control over their own data by providing a way to move it around seamlessly and quickly across clouds, anywhere, anytime. Granted, the NetApp Data Fabric won’t help you solve that specific problem, but the same concept applies. It gives data owners the option to actually own their data, as well as where it lives. Who knew that control would be so valuable?